Although Anne (Chana) Kleiman—who died in 2011 at the age of 101—was the first American-born Jewish woman to publish poems in Hebrew, and Annabelle (Chana) Farmelant—who is still living and occasionally publishing—wrote a substantial body of Hebrew verse from the 1940s to the 1960s, their work is virtually unknown today, even to those familiar with Hebrew literature in America. 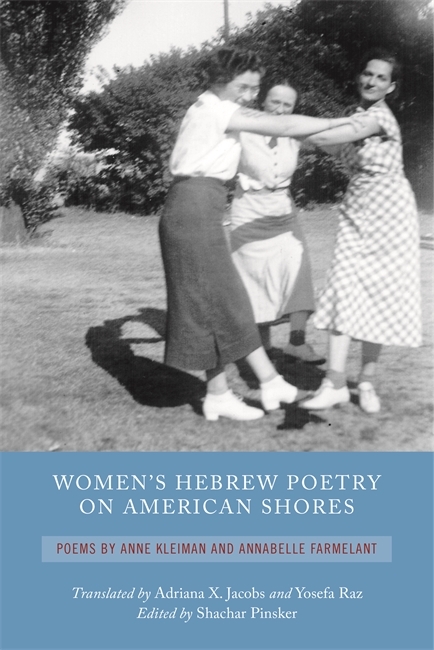 In Women’s Hebrew Poetry on American Shores: Poems by Anne Kleiman and Annabelle Farmelant, editor Shachar Pinsker recovers the singular voices of these women, introducing their captivating and wide--ranging poetry and placing it in its historical, literary, and cultural contexts. Women’s Hebrew Poetry on American Shores presents a bilingual edition of Kleiman and Farmelant’s work in a large range of themes, moods, and styles, translated into English for the first time by Adriana X. Jacobs and Yosefa Raz. It includes Kleiman’s poems that were collected and published in a 1947 U.S. volume and a selection from two of Farmelant’s poetry books, published in Jerusalem in 1960 and 1961. The translators have furnished the poems with copious notes, illuminating linguistic and cultural sources of the poetry and making it more accessible to contemporary readers. Pinsker introduces the volume with a background on the poets’ lives and work and a look at the state of Hebrew literature in the first half of the twentieth century. The volume also includes an unpublished essay by Anne Kleiman, addressing Hebrew poet Anda Pinkerfeld and her poetic work, which sheds an important light on the dialogue between women's Hebrew poetry written in American and in Palestine during the same period. Readers and scholars of Jewish, American, and Hebrew literature and cultural history, as well as those interested in poetry, gender, and women’s studies will enjoy this unique bilingual edition. Shachar Pinsker is associate professor of Hebrew literature and culture at the University of Michigan. He is the author of Literary Passports: The Making of Modernist Hebrew Fiction in Europe and the co-editor of Hebrew, Gender, and Modernity. Adriana X. Jacobs is associate professor of modern Hebrew literature at the University of Oxford and fellow of the Oxford Centre for Hebrew and Jewish Studies Her work on Israeli poetry and Hebrew translation has appeared in various publications, including Prooftexts, Choosing Yiddish: New Frontiers of Language and Culture (Wayne State University Press, 2013), Narratives of Dissent: War in Contemporary Israeli Arts and Culture (Wayne State University Press, 2012), and The Blackwell Companion to Translation Studies. Yosefa Raz is a Mandel Scholion Fellow at the Hebrew University in Jerusalem, where she teaches comparative literature. Her translations and essays on Israeli and American poetry have appeared in Jacket2, Zeek Magazine,World Literature Today, Entropy, and Bridges: A Journal for Jewish Feminists and Our Friends. Daring to enter a domain largely claimed by male artists, Anne Kleiman and Annabelle Farmelant expand the world of early twentieth-century American Hebrew verse, taking up the "holy tongue" to craft gorgeously made and deeply haunting poems. From Kleiman’s audacious stanzas to Farmelant’s artfully fragmented images, these poems range from prophetically ferocious ‘psalms’ to ironically charged ‘lullabies’ that counter any expectation of easy sentimentality. Beautifully translated and annotated, these poems are well served by excellent scholarship and artful curatorship. We can now read with admiration and deep pleasure the clear-voiced devotional address that characterizes the courage of these poets (who otherwise might have been lost to us): "I will tear out its pillars with my fingers / until I reach you / and you shall listen. This volume makes an important contribution to American Jewish literature by providing translations and commentary on these wonderful, pioneering American Hebrew women poets. Growing up and learning Hebrew in Canada, I would have loved to know about such women who were given over to Hebrew and yet so steeped in modern American poetry. Thanks are owed to Shachar Pinsker, Yosefa Raz, and Adriana Jacobsfor giving us this gift. What a delight to have the work of these two poets available to us! The fascinating phenomenon of Hebrew poetry written in America has been wonderfully enlarged by the recovery of Kleiman's and Farmelant's voices. The translations are excellent, and the editing situates their verse in its special literary moment. This book presents a beautiful collection of Hebrew poems and an essay by two all-but-unknown women poets who wrote in Hebrew in the United States in the mid-twentieth century. The skilled, nuanced verse translations by Adriana X. Jacobs and Yosefa Raz carry into English the modernist Hebrew poetry of Annabelle Farmelant and Anne Kleiman and bring them to life for today’s readers. As such, these poems create the fabric of an American literature written in a contemporary Hebrew that reaches across toward Israel and out into the world. Shachar Pinsker introduces this literary phenomenon and reconstructs and translates seamlessly from manuscripts a fascinating essay by Kleiman about another little-known woman Hebrew poet in Israel, Anda Pinkerfeld Amir.